Lipedema research is challenged by a lack of diagnostic tools and limited disease biology. The Foundation is working to build the research community and provides grants to address the basic biology, genetics, and epidemiology of lipedema. The Lipedema Foundation's Research Program is focused on building the research field needed to define, diagnose, and develop treatments for lipedema. 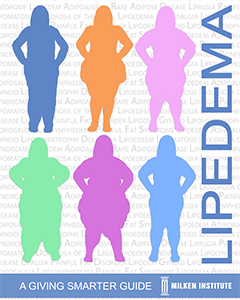 In conjunction with the Milken Institute, the Lipedema Foundation has published the disease landscape report, Lipedema Giving Smarter Guide. Read the report! Diagnosis of lipedema involves a clinical assessment and discussion of the individual’s medical history, a process that is difficult to scale within the current healthcare system. The absence of diagnostic tools to streamline or confirm a clinical diagnosis is a key unmet need, which if addressed by research, has the potential to dramatically change the trajectory of the disease. More on diagnosis. Little is known about how and why lipedema develops in a patient. Established in 2015, LF has committed over $6 million research dollars towards defining, diagnosing and developing treatments for lipedema. Our research program currently supports basic, diagnostic, genetic, and clinical researchers, as well as the University of Arizona's TREAT Program and Tissue Biorepository. For more on our grantees. Informed by the unmet needs and key research efforts identified by our 2016 Lipedema Scientific Retreat, our 2017 funding cycle has recently launched 26 new projects aimed at defining the lipedema research space. LF Grant Program and LOI Submission. First row, left to right, Ad Hendrickx (Nij Smellinghe Hospital), Harry Voesten (Nij Smellinghe Hospital), LaTese Briggs (Milken Institute), Felicitie Daftuar (Lipedema Foundation), Karen Herbst (University of Arizona), Natasha Harvey (University of South Australia), and Walter Cromer (Texas A&M Health Science Center). Second row, Rachelle Crescenzi (Vanderbilt University), Eva Sevick-Muraca (University of Texas Health Science Center, Houston), Carol Haft (NIDDK), Eser Tolunay (NHLBI), Melissa Stevens (Milken Institute), Hamish Scott (University of South Australia), Echoe Bouta (Massachusetts General Hospital), Amira Klip (The Hospital for Sick Children), Carrie Shawber (Columbia University), Kristiana Gordon (St. George’s, University of London), Bruce Bunnell (Tulane University), and Kathy Russell (Consultant). Last row, Sara Al-Ghadban (University of Arizona), Neil Piller (Flinders Medical Centre), Yann Klimentidis (University of Arizona), Erik Lontok (Milken Institute), Tim Padera (Massachusetts General Hospital), Jens Titze (Vanderbilt University), Peter Wang (Washington University), Joseph Rutkowski (Texas A&M College of Medicine), Glen Brice (St. George’s, University of London), Pia Ostergaard (St. George’s, University of London), Melody Swartz (University of Chicago), Annalisa Zecchin (KU Leuven), and Maura Donlan (Milken Institute). Attendees not pictured, Tobias Bertsch (Foeldi Clinic), Deborah Clegg (Cedars-Sinai Diabetes and Obesity Research Institute), Danielle Wildstein (Lipedema Foundation), Shannon Seeberg (Lipedema Foundation), and Philipp Scherer (The University of Texas Southwestern Medical Center).